Christmas Collection Candle Holder Set, Decorative Candle Holders Dining Table Decor by Christmas Collection at 4 The Fort. MPN: BF-E045-F179. Hurry! Limited time offer. Offer valid only while supplies last. The antique candle holder for dining table top will give your room plenty of holiday cheer; candle not included. The table top candle holders rustic is made from premium materials to serve you for years to come; create a truly unique experience you'll appreciate. 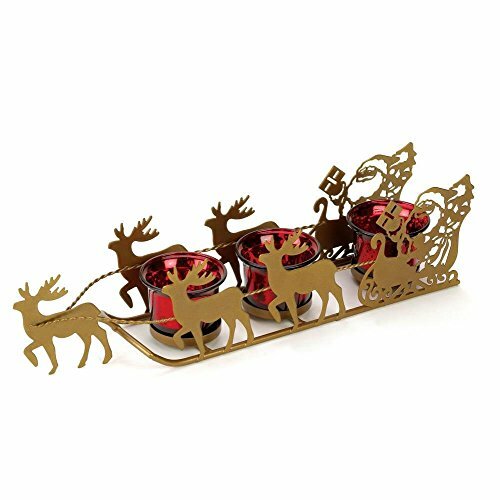 This modern table candle holder set features three red candle cups are ready to light up the golden cutouts of santa, his sleigh, and his flying friends. This set of 3 candle holders for dining table is perfect for home decor, outdoor, fashion, or playtime uses; blends of exceptional quality and dependability. Dimension of this dining table candle holder decor is: 14.6" x 3" x 3.5"; weight of this dining table candle holders set is: 0.47 pounds. If you have any questions about this product by Christmas Collection, contact us by completing and submitting the form below. If you are looking for a specif part number, please include it with your message.